Number of organizations supporting people with dementia initiated observation of World Alzheimer's Month, that is held every year in September. The most important events are held on September 21, that is World Alzheimer's Day. Alzheimer's disease is one of the most widespread form of dementia among senior people. The disease affects the regions of brain, responsible for memory, thinking and speech. The most common early symptom of Alzheimer's disease is loss of short-term memory (or difficulty in remembering recent events). Number of people suffering Alzheimer's disease increases every year. By 2050 their number will grow four times. In the USA Alzheimer's disease is the sixth widespread cause of death among people older than 18 years and the fifth among people older than 65. 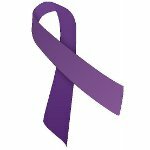 Observation of World Alzheimer's Day raises public awareness of this disease and helps recognize it on early stages. Annual events are coordinated by Alzheimer's Disease International and World Health Organization. Purple was chosen to be the color of the day. Wear purple on purpose to express your support and awareness.